I'm submitting this model to Google Earth today. Google Earth is a very popular downloadable program for users, that allows one to 'dive in' and navigate the earth as seen from the air. Originally, this would have started out at as a GIS (Geographical Information System) that was mapping satellite photos on to the globe, but a rapid pace of innovation has introduced a lot of extra possibilites. Basically, if you can place it on a map, then it should be placed on this application. 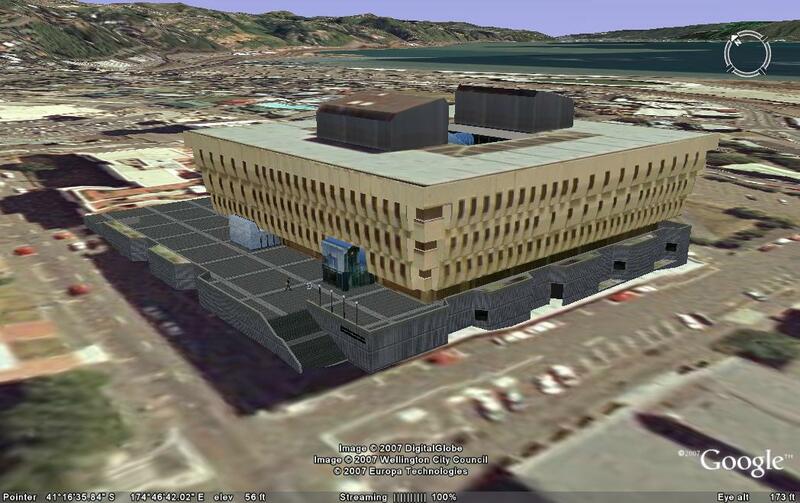 A very popular such feature layer is 3D buildings where if you navigate to any place on Google Earth, you can actually see 3D realistic models of buildings standing in their positions. The first such models were built by Google, but since has been opened up to accept user built contributions. Google released a very user-friendly application called Google Sketchup to build such models, and an online repository called 3D Warehouse to store the contributions. Google then assesses these for their suitability for inclusion. Right now this model has been submitted to Google's 3D warehouse. You can search for it by going to the 3D Warehouse site and searching for "National Library" or more specifically "National Library of New Zealand". If you are using Google Earth, please note that the model will not turn up by default in Google's 3D building layer until it goes through Google's approval process, but you can still see it by following the instructions here to get the Google 3D warehouse network link. I've been doing this project in my 'spare time' at home. Now that I've finished, my wife will finally be happy to get more of my time. Not easy being married to a techie sometimes. just in time for the Library building's 20th Anniversary of completion (5 August 2007)! Ed man kudos to you, you have truly, logically and literally put National Library on the map, pity you could have done a better job if you had used a Mac, lol, any way amazing work man keep it up. 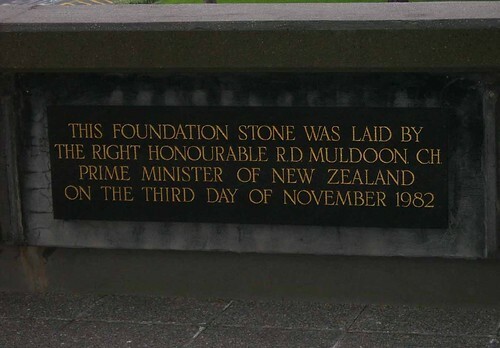 Its the little things that some people do in life that make differences, you have done NZ a fine job by placing a Capital Landmark on Google Maps. I will definitely show it to all in India when i have my new iPhone, lol, Kepp up the good work and keep the comics coming man. Your image http://farm2.static.flickr.com/1010/971357387_fb76db9f49_o.jpg would look great on the Nat. Lib. wikipedia page http://en.wikipedia.org/wiki/National_Library_of_New_Zealand. Did you make the model from blueprints? I am very interested in starting some sketch up work of my own, but don't know where to start. Thanks, Matt. Using blueprints and making all the details of the building in a CAD design like fashion would be simply too much work. A good way to use Google Sketchup is to first get some photos of the building you want to model. Go around the building taking face-on photos of each side. Put these into the computer. Then, open Google Sketchup and just draw a rectangle, pull the shape up in 3 dimensions to get a cuboid. Paste the images of each side of the building as a texture on the side of the cuboid. Then sculpt the cuboid into the shape indicated by the texture images. I learnt from the very good video tutorials provided by the Sketchup team here. To understand how to use photos, check out number 7 - Textures: Using Photos. 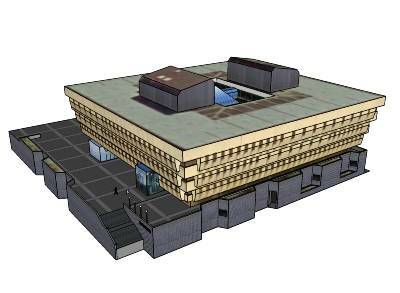 I don't have the sections or elevation drawings of the Library as such. I was able to work of some exterior photos I'd taken and a scale model that the Library has. Such material are probably available in the Library collections. One place to search is Timeframes. The very helpful Library staff can also be contacted directly here. Update from Google: "Status - Accepted to the '3D Buildings' layer"
Hi, I am Jeff D Marsh with Yantram - 3D Rendering, 3D Modeling Services Provider - a part of Yantram BPO Services Pvt. Ltd. We can serve your all kind of requirements like 3D Rendering - 3D Walkthrough, 3D Rendering, 3D Modeling, 3D Project Modeling. I like your Ideas & tricks. We are also provided 3d Services. The secret ingredient is ... Transitions! Disclaimer: The opinions expressed in this blog are those of the author, and do not reflect in any way those of the groups or organisations of which he is a member.